I currently work for Empire Today & I want to say that I PERSONNALY paid $5.00 to post this add saying that EMPIRE TODAY is the definition of Monopoly! I talk to customers every day that have been waiting for a call back from "Corporate" for two years now! I see customer service agents who place customers on hold; curse about them and talk about them then go back to the line like nothing happend. I see HR agents having relationships with agents on the floors. I talk to MARKET MANAGERS who say oh they the carpet for $800.00 ok take $50.00 off and sell it to them for $1300.00! I see comments from "happy customers" stating: empire did a great install! Then when I call the customer they say the product was never installed! Ok lets throw some more out there: I talked to a sales rep who cursed me out because somebody lowered the price (not even me) and he's not getting paid for that job anymore! I have seen other agents get fired because somebody said they cursed at a customer meanwhile that agent really did help the customer and she still got fired! Lets continue: The majority of agents that awnser your call at the 1800 have never taking a official drug test and never will! When there's a football game or baseball game agents make customers wait while they watch the game! From what I have noticed in the "SIEBEL SYSTEM" used by empire agents installs for cust past 2 years ago dont show the price product or satisfaction of the customer compared to somoeone who ordered yest? Coincidence? Lets see: There's people who show up to work when they want and still have jobs, but the people who bust there butts get fired everyday! When you call to cxnl there is no cxnl button they do have to do steps, and they will drop the price to try to keep your business! Dont accept any of those offers! Like most of the customers say to me, why did yall have to call back to offer a lower price why didnt you offer that before * SIMPLE: Empire Today will try to ripp you off and get your extra $1,000 if your *** enought to let them! I sincerely hope that everybody who reads this doesnt do business with Empire Today! I can only imagine the other agents who dare not to speak up on what they see? Review #147163 is a subjective opinion of truthaboutempire. I had an Empire SalesRep by the name of Matt from Yorba Linda who misguided us about the carpet he sold us. We specifically said we don't want to see foot prints and he sold us the most expensive one. Gues what? Its shows foot prints like a beach on a busy day! We rang Empire to say we are unimpressed and we spoke to this stone called Aurora. The only word in her vocabulary is NO, NO, NO. The Sales Rep Matt is not responding to our calls. He got what he wanted and does not want to know us. Perhaps this guy is so fustrated with his life! Dont bit the hand that gives you food! Thank God you have a job! So far my dealngs with Empire have been positive.We secured two bids for a carpet and tile job. Sears gave us an estimate of $6,424, and the salesman would not (or could not) budge from that figure. He claimed the computer gave him the figure and he could not deviate from it. He also over-measured our tile, and I had to go around with him again to get the figures back in line. His carpet and tile choices were limited, but adequate. Empire also over-estimted our tile, and I had to remeasure with them to get the square footage down to reasonable levels. Also, their choices of carpet and tile were limited, but adequate. Empire originally said the value of the install was $7,100, but they actually gave me a bid of $5,500. The next day, when I told them they were in competition and to give me their "best bid", the quote came down to $4,850, to which we agreed. I probably could have squeezed another $50-$100 out of the deal, but they also agreed to have their installer re-stretch our other carpet as part of the deal. I have tried twice now to get in a comment, but the website says I am using the wrong security code. If this one goes through, fine. If not, I am giving up. I hope you dont choose to do business with them thinking that your gonna "win" in the long run they will keep calling you, they will *** you off in all actuality you have the right to be pissed at them for being shady and not providing honest up forn business. Peace & GL to everyone STEER CLEAR. We just got a consultation today and I can not find any info about the type of flooring we choose online. I already know that we are SUPER overpaying since the salesman told his boss (when trying to haggle the price) "I've got it down to 2585$ with a 13" which I am interpreting (with my sleuth like skillz) as them pulling in a 1300$ profit. Which is about the difference from what I priced for home depot product/install. MY QUESTION is... is Empire product... Durable? I'm looking into a Laminate wood flooring. I know you are recommending to stay away but what other options are there? Thanks for the info and any help. We are DEFINETLY calling tomorrow to haggle down at least 600$ but hopefully 800$. I understand someones got to make a profit but not at too much of my expence. One said do not believe the one posting the comments that he may be a disgruntle employee go to the Better Business or ( BBB.org ) website . Well I did the info above is from there site and these are the complaints that have been filed against them ( empire today ). I was going to call empire today but I think I will go with Lowes or I will put my own floors in.I do not think empire today is worth the risk I feel that they will not be very truthful with me and the product they will try and sell me.The bbb.org is not the only site I went to, to read these kind of bad complaints there are several out there about empire today including this one. Im happy people are actually reading these sites, my intentions are to only help other people out who deal with Empire Today. I understand that you also worked for both companies but I worked there for a while and I seen and heard alot of things I prob shouldnt have..
RCOUCH701- Hello my advice is to stay cleer of them, even tho you had a great experience with the product and install theres always something with Empire Today. They will call and offer you "savings" in the future dont fall for it. I had laminent floors installed back in May 2009 and the experience was a good one. Nice salesman, and the installers were polite and did a good job. I even had a problem about a week later that was taken care of promtly. Now I have a problem with buckeling that an "independent" 3rd party inspector looked at and said was my fault. Now I can't get anyone from Empire to come out and look at. I clean the floor reqularly and have never had a water leak or anything else that would cause this problem. Anyone have a suggestion? Hello again all, in response to the last comment no I wont talk about your dislexia.. But I will say that my motives are to help other people no be robbed and taken by this company. Again I worked for them for a long time and in the end theres nothing positive I can say about empire. If you actually worked for empire today you would understand that half the people there im sorry "maj" are only there for a paycheck they dont care about you or your carpet your trying to buy. The thing is I cared for the customers at empire today, I treated them all how I would like to be treated on the phone you know?? So again who ever feels the need to say im mad, no honestly I dont care about empire today I just wish they would be honest, and straight forward with people and maybe they would stop getting bad reviews. Ty all for your time again & Happy Holdays.. I always read comments and reviews prior to going with a company, btu there is a downfall in doign this. This guy posts this artical bad mouthing Empire, but we the consumers, reading this article have no idea what is behind his motives. For all we know this guy could be jsut a disgruntled employee trying to badmouth Empire. Did you get fired or somethign recently??? Don't believe anything you read on the internet! You can't be sure anythign is true or not. Go to the BBB website to get real info. With ANY company in ANY industry you will always have disgruntled employees AND disgruntled customers. There is always someone out there who will complain about anything. 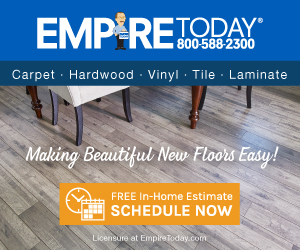 I don't have any affiliation with Empire and jsut had carpet installed in my hosue 2 days after my free estimate at home. I had NO issues and everyone was SUPER nice. BUT then again, hhow do you know I am even tellign the TRUTH! Be smart people. You can't BELIEVE everything you read on the internet! OYE! I wish I would have done more research before buying from them. It has been a horrible experience that cost WAY too much. I learn from my mistakes and will NEVER use or reommend Empire. For everyone who hasn't read this post yet and your just reachign it now. Plz read the last comment, and please dont be this foolish if empire today comes to your house heres the secret: just decline every offer they give you, eventually they will bring the price down to what you want to spend. BUT WHY SHOULD U HAVE TO DO THIS? WHY CANT THEY BE HONEST UP FRONT!? Im happy I was able to help you guys out as far as suggestions for another company I would suggest national floors direct or luna.. The 60% off sale is on a rediculus number they feel they should start at.. gl you all! I'm so glad that I read your comments. I was about to call them for an estimate, b/c I do see the advertisement for 60% off. I need new carpet, tile and/or wooden floors. Who would you suggest? Thanks!!! !